For some Moms, shopping is their cardio, for others it is the only place they can socialize with humans who won’t wipe snot on their yoga pants. For me, I genuinely have no desire to spend my precious child-free time in a grocery store, unless they are putting on some sort of free cheese sampling; nor do I want to bring them along to watch them meltdown when I say no to buying a "CONGRATULATIONS: IT'S A GIRL" balloon. I believe online shopping was invented for all hardworking parent and until there is a truly convenient store for parents, I will happily partake in Instacart, Blue Apron, DoorDash or any other genius, life-saving app millennials are out there making millions on inspired by our so-called laziness. Some sort of freshly brewed caffeinated beverage is handed to me upon entering the premises. The kid’s shopping cart to adult shopping cart ratio is always 1:1 and each aisle is equipped with bumpers like in bowling, because who wants to pay for 42 broken bottles of ketchup? There is a peaceful napping aisle where children can go and wrap up in bath towels so Mom and Dad can put things like cupcakes in their cart without creating a sugar frenzy. No shirts, no shoes, no service never applies to my kiddos—in fact, there is a shoe bin next to the door because 20 minutes in, shoes will be flung about anyways. It is a judgement free zone, so toddler tantrums result in free ice cream…for their parents. If and when everything goes to hell, there is a free childcare zone to deposit them, so for once I can actually read all the ingredients on the soup label without my daughter reminding me that she doesn't like soup and won’t eat it. Lastly, there are no candy, snacks, or rainbow sparkly toys munchkin height, guaranteed to ruin what was a successful shopping trip, upon arriving at the checkout. 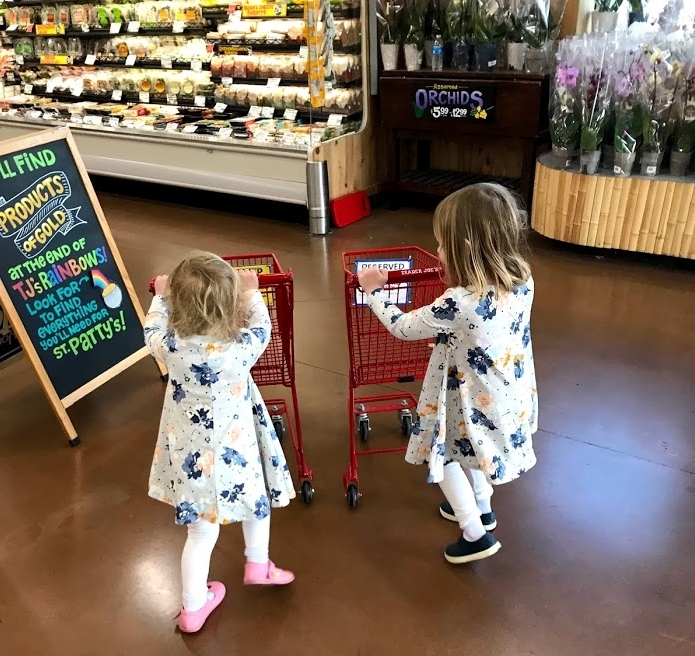 Until such a place exists or I've created it and made my millions, I will continue to refer to all grocery shopping experiences with my young children as a trip to the "inconvenience" store.